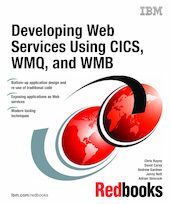 This IBM Redbooks publication provides a practical demonstration of how to develop applications that take advantage of CICS Web services facilities. This book can be viewed as a follow-on from the IBM Redbooks publication Application Development for CICS Web Services, SG24-7126-00, with the addition of using modern tooling techniques. Because we are creating a new application, we follow the bottom-up approach described in Application Development for CICS Web Services, SG24-7126-00. Although not a requirement, we highly recommend that you review that publication for a much deeper discussion of CICS Web services development topics and alternative approaches. The primary purpose of this book is to demonstrate that well structured CICS Web services are easy to develop using the CICS Web Services Assistant. We also look at modern tooling, such as WebSphere Developer for zSeries (WD/z).